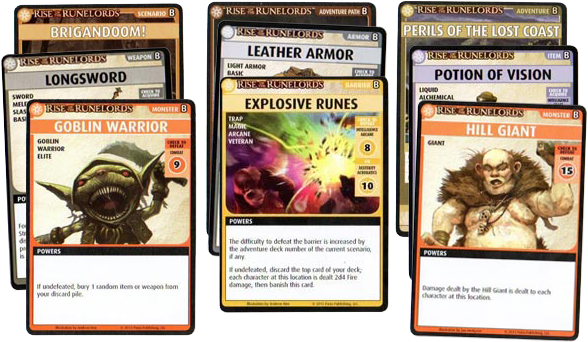 The Pathfinder Adventure Card Game is a cooperative game for 1 to 4 players in which players explore decks of cards to defeat monsters, obtain items, and complete quests. The base game starts you out with nearly 500 cards, and each of its expansions (released bimonthly) adds over 100 more cards to the game. Not only is that a lot of cards, but each card has its own special abilities that augment the rules of the game. That's a lot of rules to keep straight. With so many cards continually in development, its no surprise that errors can sometimes go overlooked during production, finding their way into the final released product. Some of the errors are minor, such as inconsistencies in key phrases, such as references to "players" instead of "characters". Other errors have a bigger impact on play. For example, the Detect Magic spell card is actually supposed to have a Arcane or Divine check of just 4, not 14! That's a huge difference! Paizo, the company that publishes the Pathfinder Adventure Card Game, is doing an excellent job of maintaining a list of FAQ questions and rules errata on their website. At the time this article was written, they've published over 90 corrections and clarifications on their website. They also highlight the most recent additions to their list in red text, in order to make it easier to find the newest updates. Don't let your brave adventurer fall victim to rules errata! The complete FAQ, including a revised version of the rulebook, is available on Paizo's website at: http://paizo.com/pathfinder/adventureCardGame. On that page, click the link titled "Pathfinder Adventure Card Game FAQ".